There are certain dishes over the years that I’ve come to associate with friends. Take my friend Jyothi, for instance, an excellent cook with a broad repertoire of preparations. Nevertheless, I do believe it might spell a riot if upon her hosting our ladies international gathering she didn’t prepare those precise traditional dishes that we’ve all grown to appreciate with great love and treasure. These are the dishes that hold meaning, a special bonding in our history, the long steaming tray of Chicken Biryani, golden colored Chana Masala with chick peas, perfectly shaped, steamed Idli rice and lentil cakes, served alongside a spicy broth, puffy hot off the grill roti for tearing apart and dipping. Each and every dish always prepared with consistent perfection. And then there is my friend Frani, daughter of Italian immigrants whose father was a chef. You might imagine as many delicious and perfectly prepared dishes coming out of Frani’s kitchen over the years too. The antipasti is never complete without Frani’s delicious roasted red peppers, and for as many seasons I’ve taken great comfort in her Escarole Soup, her giant sized meatballs in red sauce are amazing, and it goes on. 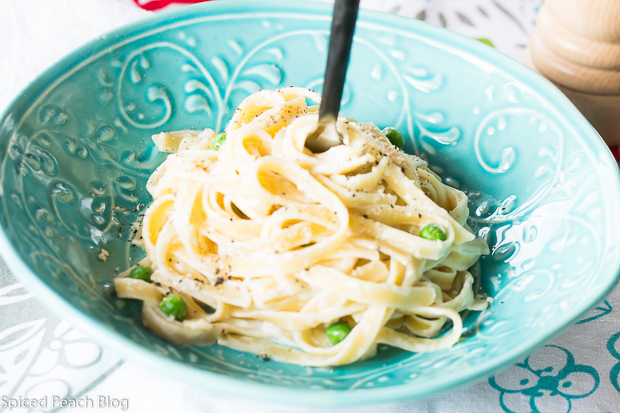 When it comes to preparing some quick dishes over the years she also has a few good tricks up her sleeve, one of my long time favorites, Frani’s Quick and Easy Fettuccine Alfredo. With a box of fettuccine you only need to combine three key ingredients, butter, sour cream, and Parmesan cheese. I add some peas to this meatless meal just for a simple, colorful vegetable addition, it is a flexible dish this way. Frani’s Quick and Easy Fettucine Alfredo is even good enough for company, and may be doubled, which I have in fact, seen Frani perform in that Italian style of hospitality fully feeding a couple extra families stopping by for a visit and ending up with an impromptu meal, complete with salad and crusty bread. Perhaps over the ages, it is among the most common of sayings expressed throughout the world that sharing food makes for the fondest of memories. I do believe it is true, from the buffet of traditional time consuming dishes lovingly prepared, to quick and easy delicious preparations, each serves up something uniquely special in life’s book of treasured moments, those memories created through the shared tables between families and friends. Boil water in a large stock pot. 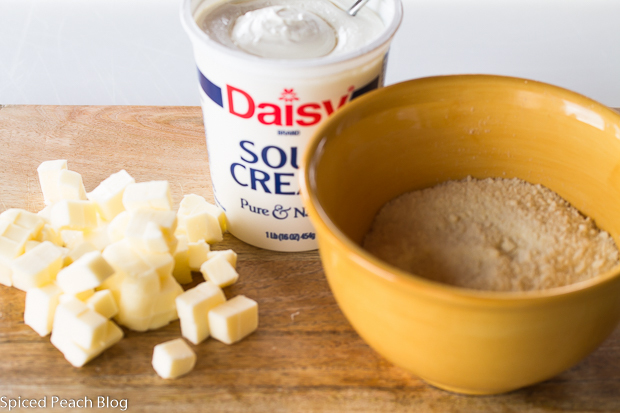 Cut butter into small bits and drop into a medium sized bowl with the sour cream and Parmesan cheese. 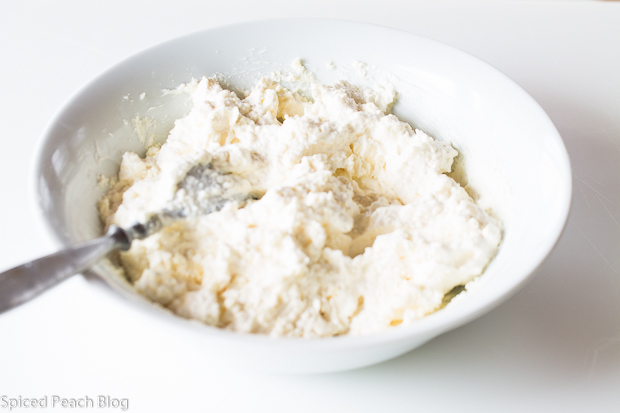 Use a fork to press butter into the mixture and stir until well blended. Cook fettuccine noodles in well salted water. If using peas, tumble them into the pasta water the last two minutes of cooking. Drain Pasta, working rapidly, use a spatula to scrape the sour cream mixture into the pasta pot, turn heat on very low, immediately tumble in the hot, drained, fettuccine. Stir well lifting and turning pasta until evenly well coated throughout add a pinch or two of salt, stir, cook until warmed through about two to three minutes. Serve hot straight away with fresh cracked pepper and a sprinkle of Parmesan. 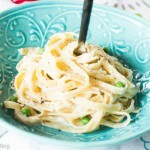 This entry was posted in Pasta- Rice-Grains and tagged Fettuccine Alfredo, Frani's Quick and Easy Fettuccine Alfredo, Quick and Easy Fettucine Alfredo. Bookmark the permalink. Post a comment or leave a trackback: Trackback URL. That is an easy recipe. It sounds like something my Mom and Dad would really enjoy. 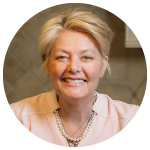 Thanks for sharing Frani’s recipe, Peggy. Have a great weekend! Hi Kelly, Thanks so much. A delicious dish in about a half hour. Hope you had a great weekend. I’m recovering from hosting all homemade Dim Sum yesterday, also very delicious but a lot more work than Fran’s Fettuccine! Hey Peggy, My wife just made this last night and it turned out great! Hi Doug, thanks so much, very exciting! Happy you and your wife enjoyed it and her improvisation as well! Thanks so much Tiny Kitchen Divas, hope you enjoy!